Is Your Mind a Constant Chatterbox Filled With Random Thoughts That Never Seem to Stop? The ability to quiet your mind can give you incredible mental powers and clarity far beyond what you currently experience. When your mind is quiet, you have the amazing ability to focus on whatever you choose to, whenever you desire. This not only puts you back in the driver’s seat of your own life, but replaces the old beat up car with a finely-tuned precision machine that is more powerful than any computer on Earth. 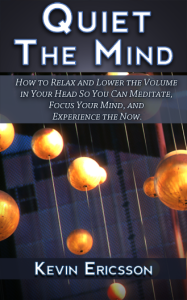 Quiet the Mind – Get it on Amazon! Remember back to when you were in a class that you didn’t want to be in? You knew that you needed to be there, but you could not help yourself from daydreaming? The worst part was that no matter how hard you tried, you could not focus on the subject matter, even though you absolutely needed to pass the course? You never knew why, and felt the frustration as other people, maybe even friends and family, learned and used that new skill. You saw them do what seemed like the impossible, and it hurt. Really hurt. Or, do you ever get some thought in your head that makes you angry or sad, and no matter how hard you try, or how much “positive thinking” you use, you can’t shake it (like something you saw on Facebook or Twitter?) It lingers all day and ruins your mood, or worse, lasts long enough to ruin relationships, careers, or your health? This is not only possible, but very likely to happen to you once you learn to quiet your mind. Yet, how often do we see those same people who are texting while walking go for an unexpected swim in a fountain? How often do we witness massive mistakes coming from the corporate world? How often do we see or hear about traffic accidents and fatalities? While many of these things can be accidental, many more can be attributed to lack of focus. This lack is often not even your own fault. It’s your mind and it’s propensity to talk and talk and talk, and never shut up. It keeps throwing you thoughts and distracting you from many finer things in life. This book is all about practical ways to quiet the noise. It’s about gaining precious space between each thought where silence exists. It’s about taking control of your mind instead of being thrown around like a rag doll by an out of control mental whirlwind. If you want a quick and practical read that you can begin implementing right now, click here to get the ebook for less than the price of a latte. For a few dollars, this could really change things for you if you put them into practice.